The EU Directive No 207/2012 on electronic labelling for Instructions for Use (IFUs) for certain medical devices was adopted effective March 9, 2012. The regulation provides an allowance for medical device manufacturers to choose electronic labelling or e-labelling of IFUs for these devices. Companies that choose this option need to have complied by March 1, 2013. When in the development process do you initiate the information for usage? How and where is product content stored and updated? Is it centralized on one platform? How are updates to content currently managed? Will this methodology work efficiently for EU requirements? Do you have a workflow in place that can be scaled to accommodate 23 languages? 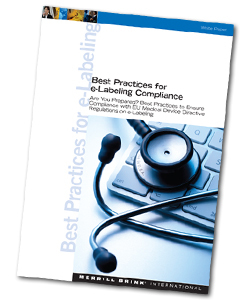 Click here to download the free whitepaper ‘Best Practices to Ensure Compliance with EU Medical Device Directive Regulations on e-Labelling’ to get a real understanding of strategies to ensure compliance and also to ensure you are best positioned to capture market share.